I failed my first driving test when I went to get my driver’s license as a 16 year old. One of the last remaining “rites of passage” into the world as an adult male, and I failed! Talk about embarrassing, the person who had gone with me had passed their test and they had to drive me home! Oh, the shame! While I did finally pass my driving test, all of us come to moments in our lives that turn out to be crossroads in our future. Many times we can see these moments coming, like a marriage proposal, or that first purchase of a home, or a career advancement, some (maybe even many) of these moments sneak up on us and surprise us with their importance even years after the event. I can think of several moments in my life that, looking back, had a profound affect on the trajectory of my life. As I look at these moments, I am filled with all kinds of emotions: gratitude, shame, regret, fear, joy, and everything in between. What about your life? Today, our Gospel Lesson gives us a pivotal moment in the Lord’s ministry on earth. It was a moment that, to this day, ripples through time still affecting the created world. Today we celebrate His Baptism by St. John in the Jordan River. Jesus certainly doesn’t need to be baptized for repentance. He is sinless. He has nothing to repent for, but He does know that we need to see Him setting the example for us so that we, too, will, in turn, become like Him and set the example for others. He also knows that creation “NEEDS” Him to enter into it so that creation can be restored to it’s original purpose: to display God’s glory and love. Water longs to be set free to do what water was always meant by it’s Creator to do: Really Clean and really refresh and really quench the true thirst of humanity. Creation was turned upside down by our first parents’ fall, but Christ unties the “knots of the Fall” by setting creation right again. Listen to a hymn of our Church from Orthros this morning: “Today the prophecy of the Psalms swiftly approaches its fulfillment: “The sea looked and fled: Jordan was driven back” before the face of the Lord, before the face of the God of Jacob! He came to receive baptism from His servant, so that our souls washed clean from the defilement of idolatry, might be enlightened through Him!” The Psalm referred to here is Psalm 114. The Lord comes to this pivotal moment in His ministry to right the world and He steps into the water so that water, and we, might be returned to our truest purpose! No wonder the Church uses water so frequently in our worship. No wonder the first encounter we humans have with the Orthodox faith is in the water of baptism. No wonder we shower our faithful with the waters blessed at the Feats today. No wonder we then take that blessed water and bless the homes of the faithful during this season. No wonder our faithful keep this water in their homes. No wonder we keep renewing before our eyes the power and beauty of this “fitting” moment in the Lord’s ministry to save us! 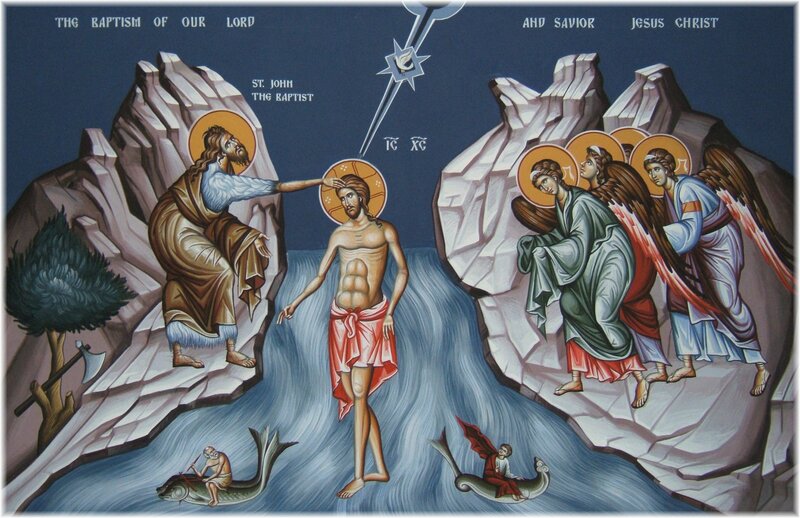 Today, on this blessed feast of Theophany when we see the Lord return water and us to our truest purpose and we hear the Father speak from heaven for our benefit “This is my beloved Son,” let us embrace the victorious truth sung today by all of us “As many as have been baptized into Christ have put on Christ! Alleluia!” Have you been baptized? Then you’ve put on Christ! Renew your baptismal joy today by once again standing and receiving the waters blessed by the Lord’s Presence and renew His Presence in your life, your home, your family, and your world. Christ is Baptized! Let us keep the Feast by embracing His life as our own! Let’s be “drenched” with this “living Water!” Let’s share this “water” with our world! Let’s be Orthodox on Purpose! P.S. 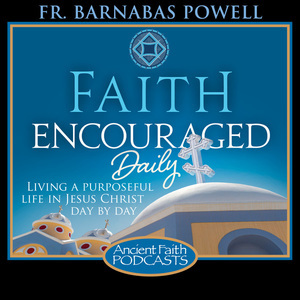 We are excited at Faith Encouraged Ministries to add the daily release of our devotionals as a daily podcast! 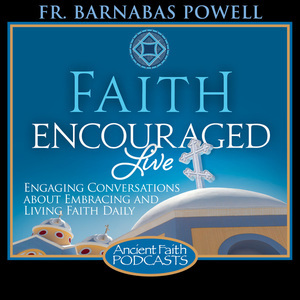 Go to AncientFaith.com and listen everyday, and share this with others who may benefit from it. Tag your share with #OrthoPost and let’s quench the spiritual thirst of our world! Fr. 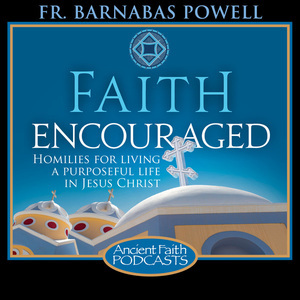 Barnabas bless, Your way of speaking and writing is like holy fire. And I can relate to the first driving test experience as well. Thank you for your vocation as priest of the one, holy, complete and apostolic Church. Please pray for us, Bradley.